As with the lowdown on #1, a full review will only make sense once the five-issue arc closes. But these lowdowns are the opportunity to mention some details that will be lost on a review of 110 pages of comics, and to theorize like it’s the 1990s again. 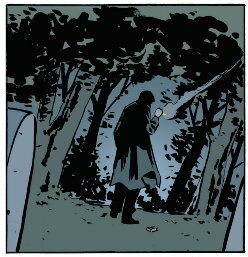 Before we delve in the story, as is often the focus in EatTheCorn, two words on the art: Michael Walsh is doing a great job on the likeness of the characters, and his style that gives importance to thick black lines fits perfectly with the X-Files. 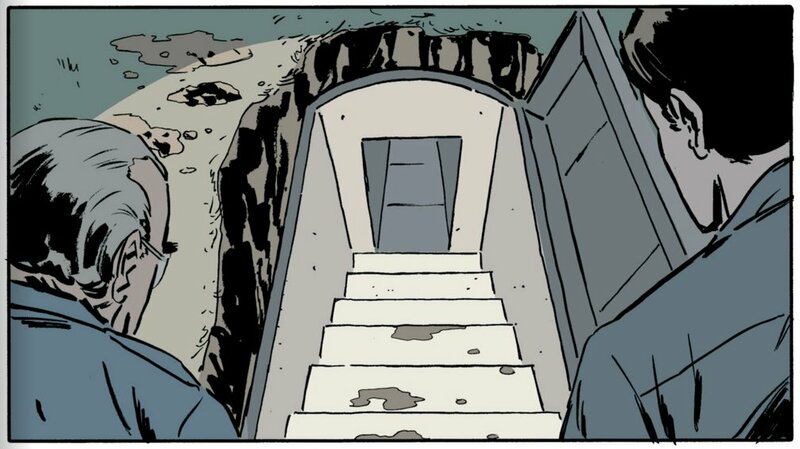 Jordie Bellaire’s colouring stands out in the issue, with scenes having their own distinct atmosphere, the dreams/flashbacks in particular. 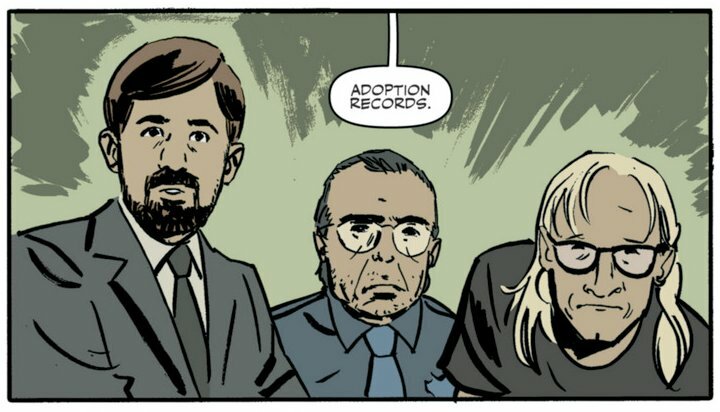 Joe Harris’ dialogue continues to be spot-on (with the exception of where Mulder explains Dana Scully and William to the Lone Gunmen, who know all this much better than us readers). We learn that Scully gave birth twelve years ago: that means that we are approximately in 2013, i.e. in real time! It’s also winter time (snow in Wyoming): perhaps the winter of 2012-13 (which includes December 22 2012) or that of 2013-14 (the collected volume of Believers will be published in December 2013). A profusion of return of characters! First of which is Special Agent John Doggett, still in the FBI and in a counter-terrorism unit, as Carter had fleetingly mentioned in the commentary track for I Want To Believe. Five pages in, and already he’s apparently a victim of an explosion by the shape-shifting Acolytes — a good, swift, scarring way to show what a menace these Acolytes are! Was that the end of the road for Doggett? Given how the comic seems keen to revive everybody else, maybe not. 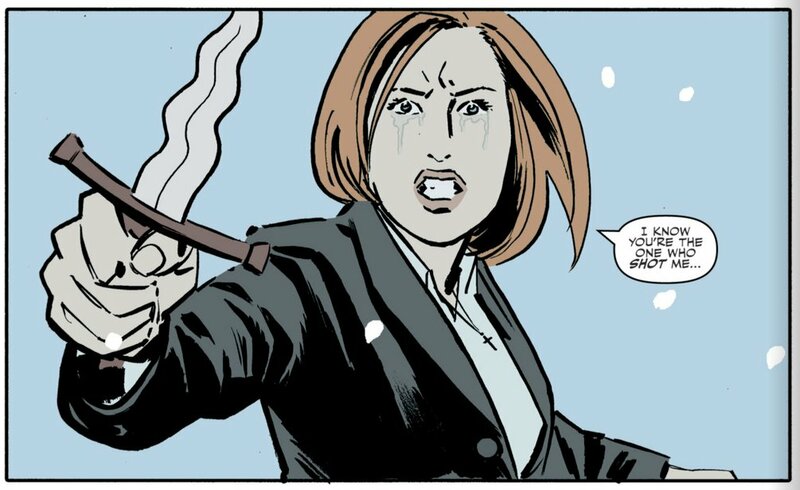 It depends to what extent the comics can have the freedom to have game-changing events, or whether Carter wants to restrain Harris to keep his characters for an ever-delayed XF3. The Acolytes and the Deacon have shining blue eyes, a sign that this Blue Oil flows through them. In Scully’s dream/flashback to her giving birth to William (from 8X21: Existence, also our first glimpse of Monica Reyes in the comic), it is implied that the Acolytes are Supersoldiers — or at least that’s how Scully feels that threat. 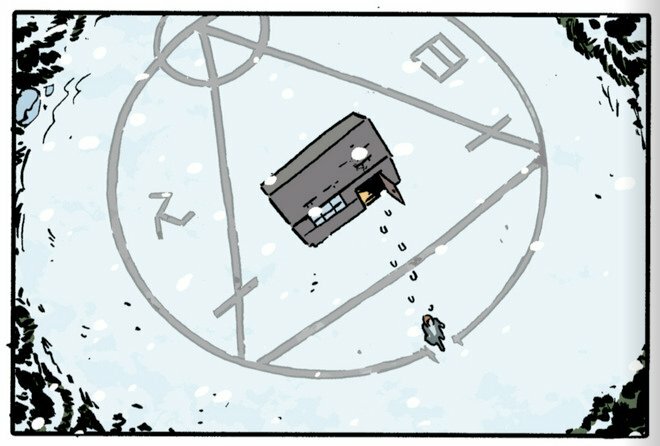 Scully mentions “Like Jeremiah Smith or the Bounty Hunters, Supersoldier replacements, alien-human hybrids!“: This is a nice rundown of plenty of beings we encounter in 9 years, the mention of Jeremiah Smith is particularly nice (I suspected the Deacon to be him), however they’re not all the same beings (and the Bounty Hunters are not even hybrids, see the Hybridization dossier). The Acolytes are certainly something new, as Supersoldiers could not shapeshift and alien-human hybrids had no Black Oil in their eyes. Incidentally, this is just issue #2 and we’re already full of characters and concepts and storylines that it took years for the series to establish, and with some caped characters that do feel comic-book-y! 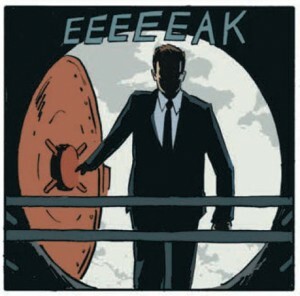 It will be interesting to see how the comics will keep a sense of mystery and slow reveals while keeping in with the realistic tone of the TV series. The Deacon seems to be protecting Scully from nefarious Acolytes. The Acolytes hunt Scully because she is “the Bringer” (of William), ready to kill her with a sacrificial knife. The Deacon protects Scully from them by placing her inside a circle of a grey material: this could be magnetite (in which case how does the Deacon protect himself?). The circle is part of an intricate symbol that looks to be inspired by alchemy symbols, that I expect we’ll see again. Black Oil infected humans could kill others with a flash of radiation; here, the Deacon can selectively kill Acolytes (but not Scully! ), and the Acolytes cannot do the same to kill the Deacon, indicating some profound differences between them. Scully is taken to Wyoming, the state with the flag with the white buffalo (see 3×02: Paper Clip), the High Plains and Yellowstone National Park, and as Skinner reminds us, the home of William and his adoptive parents the Van de Kamps! With so many Acolyte activity and Blue Oil around, it’s still not clear why they still haven’t found or haven’t had access all along to William. And what are the reasons why William, after all the events of 9X17: William, still important? That’s a question we have had for an eternity and one Carter hasn’t been able to answer satisfactorily; will Harris? 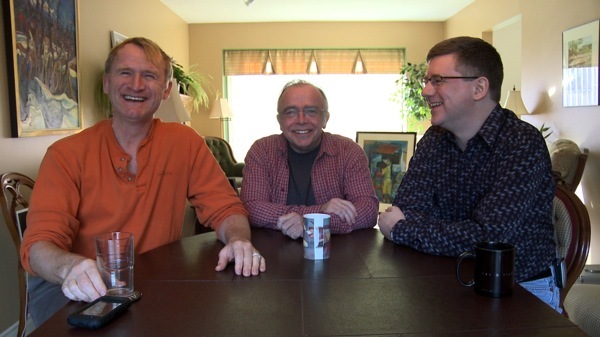 For help, Mulder turns to…the Lone Gunmen! The entire series’ most preposterous mistake is corrected, Dean Haglund’s theories become true and the Arlington cemetery coffins are empty: the Lone Gunmen are alive and well, living underground, having faked their deaths! That, of course, invalidates the emotion of 9X16: Jump The Shark, and clashes in terms of continuity with Mulder seeing them as ghosts in 9X19/20: The Truth — but given how painful that decision was for both the writers and for the fans (plus, we didn’t see them dying) I’m willing to go along with it. What is more puzzling is their occupation since then: they are hiding thanks to a federal relocation programme, the FBI helped them, and they have been helping the FBI with information technologies assistance since then (and also haven’t aged a bit). Not only that, but Langly helped the US Department of Defense and Israel with Stuxnet, a computer worm that infected Iran’s nuclear facilities (real, but of debated origin), and he boasts he can control Predator drones with a headset only. The Lone Gunmen, helping the FBI! This is this issue’s most disturbing news. The Cigarette-Smoking Man and his pack of Morleys! This, although initially exciting as a fan, makes no sense whatsoever. After several near-deaths, Carter made sure that the CSM’s death in The Truth was final, on-screen, right through the skin and bone and brain. If this proves to be the real CSM I’m going to use the phrase “jump the shark” already! But with so many shape-shifters around and given the power CSM must have yielded in the US government and international organizations, it could easily be an impersonation. The CSM being in contact with the Lone Gunmen would also only make sense if this is not really the CSM. So are they trying to resurrect everybody? Nobody ever really dies on the X-Files, but there are limits to the suspension of disbelief! Among the characters that are still legitimately alive and could make a return are: Monica Reyes (teased for #3 already), Gibson Praise, Marita Covarrubias, Jeffrey Spender, the Bounty Hunter(s), the Toothpick Man, Jeremiah Smith (if he somehow survived), Alvin Kersh, Cassandra Spender, and good old Conrad Strughold. Among those that could remotely plausibly be resurrected are: Diana Fowley (never died on-screen), and, yes, Alex Krycek! How? his change of heart to abandon resistance in 8X21: Existence and his offer to “give you a thousand lives” opens the possibility that he could somehow have turned into a Supersoldier. This entry was posted on Saturday, July 20th, 2013 at 11:53 am	and is filed under Comics. You can follow any responses to this entry through the RSS 2.0 feed. You can leave a response, or trackback from your own site. I agree with pretty much everything that you said. The Lone Gunmen coming back was cool, but I’m still trying to retcon how they appeared as ghosts to Mulder in “The Truth” (maybe it was his imagination then? I’d like to think not). Also, the CSM reappearing is rather odd. He was so very near death in “The Truth” and, like you pointed out, fried at the end. I mean, I suppose he could’ve been brought back to life, but I’d rather it be an Alien-Bounty Hunter or something. I’m not sure why anyone would want to pose as the CSM when dealing with people who should know/definitely know that he has to be dead. That would pretty much reveal at once that this guy is not who he appears to be. As to how the CSM could have survived: If the hybridization operation back in the beginning of season 7 did actually work (the positive effects could have only manifested later on), the (self-) healing capabilities of some of the alien-human hybrids could have enabled him to recreate his body (at least if we assume that a Mulder-/Gibson-Praise-type hybrid could ever develop super soldier like self healing abilities). But even then, the fact that the CSM could enter and live in the magnetite Anasazi pueblo does seem problematic. Anyway, the real problem is that I don’t see much potential the CSM in the story. I’ve always thought that the “ghosts” we saw in “The Truth” weren’t actually ghosts, anyway. I see them as stuff in Mulder’s head. Aspects of his psyche/personality that were given voice (and appearance) by people from his past. Sort of like the proverbial angel/demon on one’s shoulder. This perspective also allows for TLG to have been alive at this time, which I’m thrilled to see in S10! Same here Doug, I know X Files deals with the paranormal but I think that the Lone Gunmen turning up as ghosts to have a bit chat with Mulder is far fetched. It works as better as internal conversation in Mulder’s psyche even before Season 10. The gunmen controlling drones is off-character to me. Helping the FBI is one thing, but didn’t these guys have some moral compass?